As a Dominican Friar, Fra Bartolommeo, called Baccio della Porta, painted works steeped in religion during Italy’s Renaissance. Born in Tuscany, Bartolommeo studied under Cosimo Rosselli (1439 – 1507), a Quattrocento painter from Florence. After this apprenticeship he entered into collaboration with Mariotto Albertinelli (1474 – 1515), who was also a pupil of Rosselli. In 1490 the two young painters began a studio together in Florence and were both later influenced substantially by Raphael (1483 – 1520). By the late 1490s, Bartolomeo became dedicated to the religious reformation movement lead by the Dominican priest Girolamo Savonarloa (1452 – 1498). Savonarloa denounced much of the Renaissance and this led Bartolomeo to abandon painting for a number of years. Though, he did paint some while following Savonarola, completing a well known portrait of the priest in 1498. While working on a commission for the Ospedale di Santa Maria Nuova, the Universal Judgment, Bartolomeo left the work incomplete and became fully dedicated as a Dominican friar in 1500. 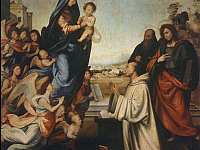 He restarted painting again in 1504, leading a monastery workshop, and also began his work on, The Virgin Appears to Saint Bernard (The Vision of St. Bernard) for the Badia Fiorentina Church in Florence. This is one of the artist’s works which now hang in the Uffizi Gallery. When in the church, his work appeared amongst other artists such as Filippino Lippi (1457 – 1504) and later work from Il Bronzino (1503 – 1572), among others. After Bartolomeo finished here, he befriended and studied with Raphael, which made a distinct impact on his artwork thereafter. He then relocated to Venice, where he developed his style further with the influence of the Venetian use of color. In his return back to Florence, he also reunited with Albertinelli in the city of Lucca in Tuscany. 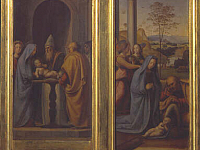 He worked in the Lucca Cathedral, painting the Madonna and Child with Saints altarpiece and also went on to paint in the Sala del Consiglio in Florence and then for the Besançon Cathedral. His works of this time, such as The Mystical Marriage of Saint Catherine, epitomized the High Renaissance style of restraint and was one of the first artists to place his figures in flowing nondescript drapery instead of decorative costume. 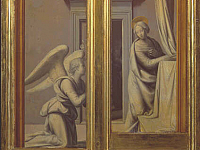 His use of flowing draperies was a technique he learned from his time with Raphael. By 1513 he traveled to Rome, painting a number of pieces including, Peter and Paul, but returned to Florence and opened a studio in San Marco. 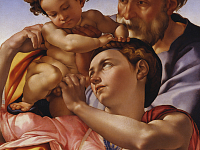 He was a leading artist of Florence for some time, among his contemporary Andrea Del Sarto (1486 – 1530). His last complete work in Florence was the Noli me Tangere fresco, but also left a series of drawings behind for planned works. His works could evoke powerful emotion, with rich Venetian coloring, a use of sfumato for depth, and harmonious poses and depictions of movement.